Human resources is about the people factor in your organization: the HR person or department aims to attract the best talent and keep it talent happy and productive for as long as possible. If you’re an HR firm, you’ll be competing fiercely with other HR outfits in an effort to maximize recruiting, retention, and motivation but also increasing productivity and reducing operational costs. That’s a long way of saying you need to keep people happy and keep your company or clients making lots of money, but it can be a challenge to do both at the same time. At the heart of both these goals is communication. Better, more thorough, and more efficient communication leads to more work getting done with fewer hiccups and inconsistencies. It also means happier, more engaged, and more informed employees. So how can you improve communication in an age characterized by such a huge array of new communications technologies that have plenty of curb appeal but uneven track records of quantifiable success? The answer is through SMS messaging. If you can get an entire organization subscribed to a universal SMS messaging system, you’ll have cleaner employee exchanges, more efficient operations, and inevitably a happier, more involved staff … but it’s about far more than just sending texts to one another. Currently, 3 billion mobile subscribers use 6 billion mobile devices around the world, so naturally mobile messaging ranks as one of the most preferred means of communication, especially among millennials in the 18-to-34 age group. SMS text messages are targeted, which means it’s a more personal form of communication than a staff meeting, and it’s convenient, since most people carry their mobile phones with them at all times. It also carries the benefit of being immediate. Telephone calls can be hit-or-miss, and face-to-face meetings are hard to coordinate, but text messages are sent immediately and can get a small or large group up to speed in a short amount of time. According to ADP Research Institute, 42 percent of today’s workers already use mobile communication for typical workday tasks and activities, and 70 percent of companies believe that mobile communication can improve employee productivity. MMS and SMS notifications can handle a majority of basic employee communications, such as reminding a group of participants about an upcoming event or notifying the entire company about an achievement. Given that employees are already using their mobile devices during the workday, employing a company-wide system for such communications will keep everyone on the same page—with minimal upkeep over the long haul. 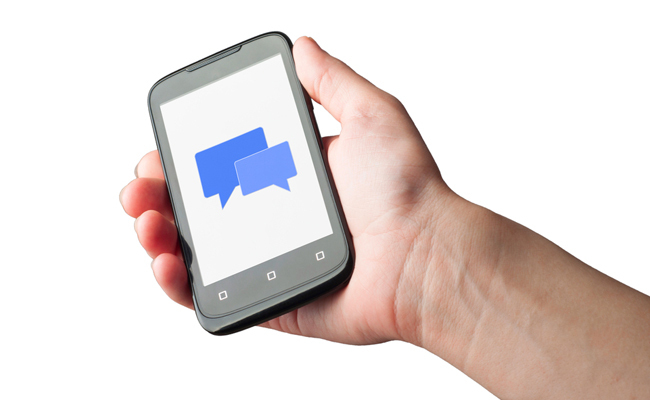 Overall productivity and efficiency can be increased through the use of SMS and MMS messaging. For example, companies lose billions of dollars to payroll errors and simple time tracking issues every year, but SMS offers a variety of solutions to the problem. With a mobile outlet for time tracking, employees are able to track their time more precisely and reliably, and outgoing SMS reminders can alert employees when an error has been made or a piece of data still needs to be submitted. In effect, it streamlines the time-tracking process, which reduces the stress for each employee and at the same time prevents significant financial losses for the company. Emergencies occur when you least expect them, and 72 percent of workers say they don’t feel confident their workplace is prepared for a natural disaster. Your most important job as an employer during an emergency is to keep your workers as safe and well informed as possible. Unfortunately, getting all your employees informed in the same way at the same time is difficult—especially if a power outage occurs, or other factors block traditional lines of communication. Multi-channel mobile communications, like SMS, MMS, push notifications, and voice, are the best way to operate under emergency conditions, because you can get all your workers up to speed quickly, no matter what communication channels they have access to. Two-way communication also becomes possible, which gives employees the chance to relay vital information about emergency conditions to the men and women in charge. SMS and MMS services can also help align your remote workforce, or employees who work from home during certain days of the week. SMS and MMS systems extend to mobile lines, independent of any physical establishment, so you can keep everyone informed as if they were all in the same room. Doing so can make remote workers feel closer and more engaged with the office-based team, and streamline communication between individuals who may not otherwise be near one another. It’s difficult — and some days, impossible — to get every intended meeting participant in the right place at the right time for a meeting. MMS and SMS text systems proactively solve this dilemma, because they can give everyone reminders and updates when a meeting is coming up … and multiple reminders if necessary. From there, individuals can easily communicate when they’re running late, so their colleagues will have a chance to work on other projects or delay the meeting until everyone can attend. The end result is more productive meetings and fewer scheduling discrepancies, which keeps everyone happier and more productive. Introducing an SMS or MMS system to a business accustomed to traditional means of communication can seem like a challenge, but the beauty of it is that most workers are already familiar with the technology. Given just a few procedural adjustments from the top, most organizations can adapt to the system in as little as a few weeks. The key takeaway here is that SMS is the preferred communication method for the majority of modern workers, and it can be used in a number of situations from last-minute scheduling to emergency updates. Not only can it increase the overall productivity and efficiency of your firm’s workforce, it can also keep employees more satisfied with their work and more engaged with their employer, leading to higher retention rates, and therefore greater company success. If you’re interested in more information on how mobile messaging can improve your employee engagement, contact us today.